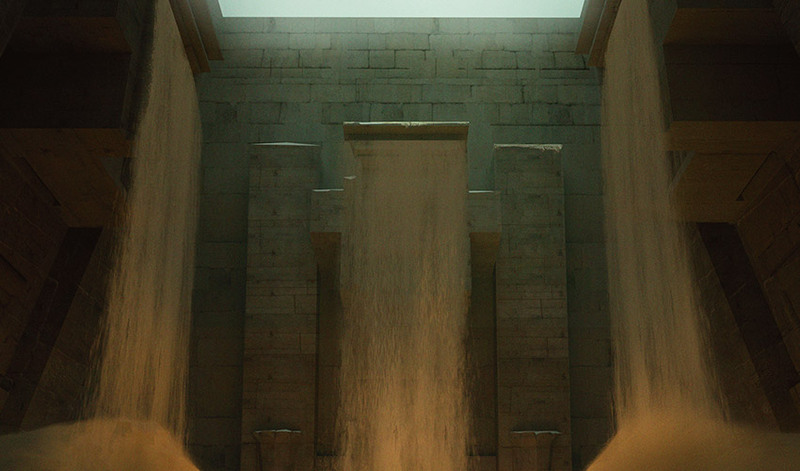 The city of Naktamun is too perfect to be real. It is glistening and immaculate, and its citizens are young and full of faith. Determined to uncover Nicol Bolas's intentions with the plane, Nissa and Chandra explore the city in search of answers. What they find challenges every assumption they had about Amonkhet. She is surrounded by darkness and an unending well of malaise. The pulse of this plane beats weakly around her. I lived, once, the plane seems to whisper in a hoarse, sand-scraped voice. She senses life, but it is not alive. What is left of the plane defiantly groans. He could never truly kill me. I abhor death. An image: half-eaten, undead antelope being trailed by hungry happy vultures. An elephant mother caressing the newly-arisen body of her dead child. Those that die will always return. That is the Curse of Wandering. My gift. She understands. What is dead, if it hasn't decomposed, will rise. Suddenly, she sinks, far, far beneath the surface of the plane. Her consciousness is somewhere hundreds of feet underground. She can sense the cavern she is in was made long ago by careful hands. The stale air is dense, dark, still against cloying clay and packed sand. The only movement is the writhing of scarabs. Their dead were sent here for me to keep them safe from rot . . . The halls are empty. Not even the beetles know where their food is. She has no physical form in this place. Her body is high above on the surface, sweating and shaking with the fever of a malnourished world. This once was my most treasured place. It is the echo of a scream. She understands now that these were catacombs. It was once safe and good. I protected the vessels to keep their souls alive and he took. . . them . . . The elf's chest tightens with anxiety. Her spirit, here, can feel it up above. The cavern is completely empty. Please, he took them all, corrupted them all, end my guilt, I could not protect them—! Amonkhet was old, grieving, and desperately frightened. The morning light spilled through the window. The larger sun rose, illuminating the linens around her bed with a gauzy, drowsy glow. It was clean, warm, and the air smelled of a soft desert morning, but the tightness in Nissa's chest wouldn't ease. Perhaps topside it was worth a try? She closed her eyes and silently called out to the soul of the world. It felt like settling into a tub of tacks and nails. Nissa gasped and shut off the connection. The tightness in her chest remained. She sat up and looked over the rest of the room. Chandra and Jace were both still asleep, but Gideon was conspicuously absent. The woman-shaped lump on the bed across the room shifted slightly. Chandra opened a single sleep-clogged eyelid. "Whaddisit?" Jace hadn't moved, but Nissa kept her voice down anyway. "I'm going to go on a walk to find the woman from yesterday. Can you come with me?" "Mmph. Sure." She sat up and stretched one arm at a time, then rubbed the sleep from her eyes. "I want to get breakfast first before we— "
On the word "breakfast" a white-bandaged mummy burst through the door carrying a tray of bread and a carafe of what smelled like ale. Nissa yelped and backed up against the wall as Chandra screamed in tandem. Jace fumbled out of bed, shocked awake by the commotion, disoriented by the unfamiliar room and the dead body bearing breakfast. The mummy took no notice, placed the food tray on a side table, carefully adjusting it so the ale wouldn't accidentally tip over. The three stared silent in alarm as the mummy gracefully straightened, turned about-face, and exited the bedroom. The only noise was their own panicked breathing, then an explosion of questions. "Why is it inside— "
"Don't they knock around here?" "That better not have been you!" Jace yelled at the wall. Liliana's muffled voice responded loud and sharp with a quick, "Not mine!" Nissa scrambled off the bed, all limbs and wringing hands. "I can't stay in here. I need to go for a walk." Chandra nodded and pulled on her boots. "I'm awake now, I'm coming with." She made quick work of returning her bedlinens from the floor to their proper place, then threw on her armor and metal. Nissa wondered distantly how in the world she could wear all that and not get too warm, and then realized what a foolish question that was. Jace was up and prodding the food the mummy had left on the table. He scowled at the dark beer. "Gimme a moment to wake up." Chandra wandered over as she laced up her plate mail. "Not exactly coffee, is it?" "It is the opposite of coffee," Jace replied. Chandra waved a farewell and Nissa followed. Even in the mornings, Naktamun smelled of sweat. Not of labor, nor of torture, but of training. Packs of young joggers maneuvered in swarms through the city streets. Some pairs were lifting weights in the uncountable dozens of training arenas that lined the limestone thoroughfare. Others were sparring with rehearsed motions in carefully roped-off gymnasiums. There were no shops, no wares being sold, no bakers nor butchers nor builders nor police. Every resident was awake, training, and not one could have been over the age of twenty. "I feel old for the first time in my life," Chandra said, half-kidding. She and Nissa stopped momentarily to watch an eight-year old spot a six-year-old while they bench pressed a weighted bar. The child huffed with effort while trying to lift the bar with both clenched fists touching each other. "Don' do it that way, you'll lose contwoll of the bar!" the standing child chided. Nissa leaned toward Chandra and whispered quiet enough the children wouldn't hear. It was the first time Nissa had ever used the word out loud. Chandra nodded solemnly in agreement and they continued walking. Every building that lined the street was crisp white, painstakingly clean, and well kept. No litter crowded the street, and no potholes tripped their step. The two women kept close together through the endless groups of young adults and came to the revelation, soon enough, that no one else was simply walking on the street. Every person was exercising except for them. When Nissa looked closely, though, she saw how the order was maintained. A mummy was painting the side of a wall with white paint. Another swept the entryway to dormitories, yet another led livestock to stables, one dumped a chamber pot into the gutter. The enchanted dead were the ones who did all the work. "Why would Nicol Bolas create a plane and then abandon it like this?" Nissa asked. Chandra shrugged. "Ego, I'm guessing? Making an entire plane to worship you feels like something in his wheelhouse." "But wouldn't that make him want to stay here?" Chandra didn't have an answer. Nissa eyed the mummies as they walked past and considered her own perception of death. The Mul Daya nation of Bala Ged had a relationship with the spirits of their elvish ancestors that set them apart from the other nations. Death and the spirits of the dead were as much a part of their lives as the natural world. But death here, on the other hand, was much more dependent on its physical aspect. Preserving the corpses must be as pivotal to their culture as offerings to ancestors were to hers. If I try to understand something, then I will not be afraid of it. Nissa thought of Yahenni. Their death was unlike any she had seen before. Perhaps death was different from plane to plane. A headache manifested behind Nissa's temples, and she swayed where she stood. She looked down. Her stomach roiled with nausea. "What's wrong?" Chandra asked. Nissa realized she had stopped in the middle of the street. "I don't have the words for it . . . "
"Are you feeling sick? Here, sit down." Chandra led her toward a fountain in the plaza square. Nissa watched, head swimming, as Chandra approached a white-bandaged mummy. She saw her awkwardly gesture and point. The mummy looked her way, exited the plaza square, and returned moments later with an empty cup. Chandra took it with a thankful nod, then jogged back toward Nissa and the fountain. "I know it's from one of the dead things, but I think it's safe to drink with." Nissa took the cup from Chandra and dipped it in the fountain. She drank, and realized as she did she had let her thirst get the best of her. Chandra refilled her cup a second time and smiled. "Let's rest for a bit. Can't fight dragons when we're dehydrated." Nissa sighed out a sad laugh. I couldn't fight anything right now. They sat on the bench for several more minutes. Nissa was thankful for the shade. 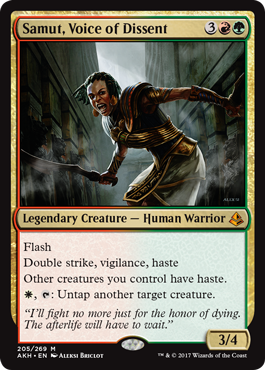 The malaise of this world was seeping into her, and she knew that it wouldn't let up until she left Amonkhet for good. The sooner they could defeat the dragon, the better. She caught herself staring at the sky. Far above she could see the gentle shimmer of the Hekma barrier and the pale blue sky beyond. Her view of the infinite sky was interrupted by the awful horn motif on the edge of the building in front of her. She polished off a second cup of fresh water. "Thank you for accompanying me this morning, Chandra." "Nowhere else I'd rather be." Chandra fiddled with the straps on her vambrace, her eyes darting in Nissa's direction. An involuntary smile flitted across her face—a blush, an inescapable dash of sentiment. Nissa scoffed. 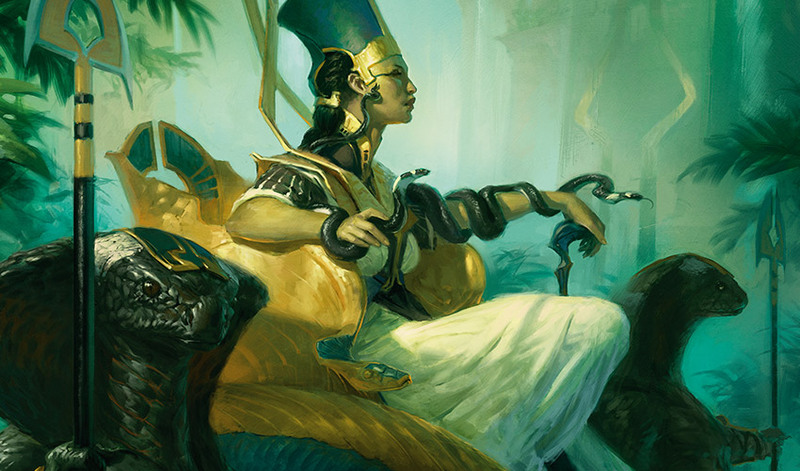 "I can think of at least twenty places I would rather be than Amonkhet." Chandra's smile turned plain and she looked down. The two sat in semi-silence, comfortable for one and fraught with unspoken words for the other. Nissa took a breath, allowing the churn of the fountain and the cool shade above to her soothe her nerves. Chandra kept her eyes focused on her buckle. "I've never spent so long in cities before," Nissa said. "Between Kaladesh and here, I've had more than my share of people." "You seem to be getting along fine," Chandra replied. Nissa shook her head. "I have gotten better at hiding my discomfort. Being around others so often is draining." "But not with us, right?" The question caught Nissa's attention. She watched Chandra intently unbuckle and rebuckle the same strap of her vambrace. Nissa frowned. Thought over her words. "Yes and no." Fiddling hands paused, while a meandering mind searched for the words to lend shape to unfamiliar feelings. "Friendship with all of the Gatewatch is still quite new. I'm still trying to understand what it means to have friends in the first place," Nissa said. Chandra made a small noise and looked out on the plaza, her posture heavy and leaden, her fingers suddenly quite still. Nissa continued. "On Zendikar, I was without the company of people for most of my life. The plane was the closest thing to a friend I had. Learning to trust has been . . . slow—and there is still much for me to learn. Understanding and sustaining friendships is daunting when one has never really done it before." Chandra shifted awkwardly. "So . . . friendship?" Nissa blinked. Chandra worked very hard not to stare. Nissa closed her eyes, and took another deep breath, her headache receding. It felt good to confess insecurities. She smiled and looked Chandra in the eye. "I am thankful for your companionship. You have taught me much about what it means to be a friend, Chandra. It means much to me." "Right. Yeah." A soft smile returned to Chandra's face. "I want to be a good friend to you." Nissa beamed. "And you are. I am trying as best I can to be one in return." Chandra's small smile spilled into a tight but earnest one. She locked eyes with those of her friend's. "You're doing fine, Nissa." Reassured, Nissa placed her cup on the edge of the fountain. "I think I'm feeling better. Let us continue." The elf stood and walked on. After a breath and a heavy sigh, Chandra followed. They walked until they found something old. Rhonas's Monument was immense and incapable of subtlety. The primary structure was shaped like the massive head of a cobra, and unlike the other buildings around it, had the weathered look of a structure that had seen more than its share of lifetimes. The building sat at the edge of the river, its eyes set on the horns in the distance. 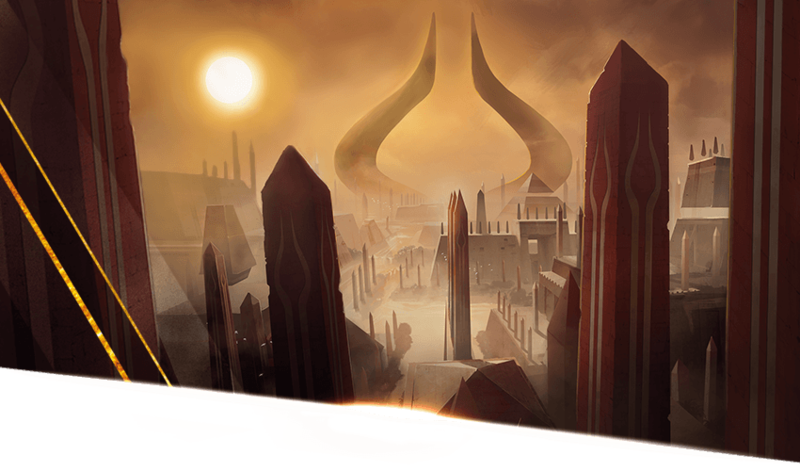 As Nissa approached, she noticed a strange shape sitting on top of one of the obelisks near its entrance. 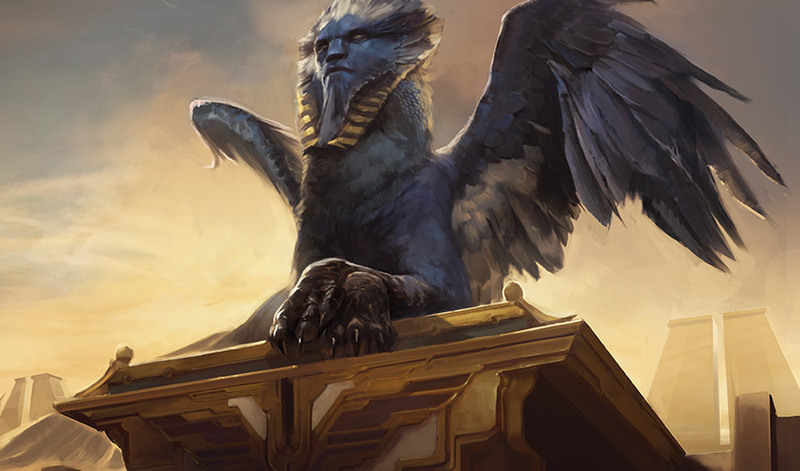 A solitary sphinx perched above, looking down with an unreadable face at the crop of acolytes training below. Nissa stopped at the base and looked up. Chandra followed her view, visibly uncertain of how to talk to the sphinx. "You must be the travelers I have heard so much about." Nissa turned, meeting eyes with the oldest person she had seen on Amonkhet yet. She seemed to be in her mid-thirties, with a stern face and the high hat of a vizier. She walked with her chin high and shoulders back. Nearly everything about her posture stood in contrast to the multitudes of just-older-than-children they had encountered so far. The woman held up a hand in greeting. "Temmet sent word to the rest of the Temples that we had guests in the city." Chandra stepped forward to speak. Nissa smiled a bit. She liked that Chandra knew her comforts and anxieties. She liked that the two of them had silently determined their own order of operations. "Hi," Chandra said with a winning, freckled smile. "We were hoping to speak to this . . ."
"Sphinx. I'm afraid you won't have much luck with your conversation." The vizier spoke with command. She reminded Nissa of Lavinia back on Ravnica, one who knows all the rules and is constantly annoyed no one else bothered to memorize them. "Well, to be completely honest . . . it's tragic," the woman said with a distant sigh. "The sphinxes are a sad story—gifted with infinite knowledge and cursed with the same dismal fate." Nissa and Chandra were both silent with concern. The vizier gave them a blank, dry look. ". . . They all got laryngitis at the same time." The two women stared back. The vizier smiled, all teeth and mirth. ". . . I'm kidding. They're fine." Chandra chuckled awkwardly. Nissa didn't think it was a very good joke. The vizier's demeanor dramatically shifted, and she leaned her weight onto one foot. Nissa noticed a sweet little snake coiling around her hand—a patient pet. The vizier held up her other hand to block the light of the suns and looked up to the sphinx. "They actually just took a vow of silence until the God-Pharaoh's return. Which, lucky us, is quite soon! I am the vizier Hapatra. How may I be of service to you travelers?" "I am Nissa; this is Chandra. We come from a faraway place," Nissa replied. "Your customs are quite strange to us." Chandra made a noise of interruption. "What she means is that we were wondering about the . . . ah . . ."
She gestured to a pair of mummies sweeping the front steps of the monument. "You were curious about the Anointed?" Hapatra said. "Yes!" Chandra nodded. "Yes. Why are there so many of them?" "They are the ones who make our lives of competition and dedication possible." She motioned to the monument in front of them. "So long as the body exists, the soul will exist as well in the afterlife. We preserve the bodies left behind, and since training for the Trials is our mortal duty, we enchant the vessels to act in service to humanity." Nissa shifted uncomfortably. The catacombs Amonkhet had shown her were places of permanence; what was sent in there was meant to be securely kept. And yet Hapatra spoke as if mummies had always been servants . . . The vizier absent-mindedly transferred her pet from one hand to another. "These mummies are safe within the Hekma, they are cared for, and they are given purpose through labor. The souls these ones housed will not have a destiny as triumphant as the one that awaits those who complete all Five Trials, but their fate is preferable to having one's vessel decay outside the Hekma. Decayed body, no existence. There is nothing worse than that." "And the Trials?" Nissa asked. For a topic that was omnipresent, she was frustrated at how little information was shared openly. Hapatra's brows knotted. "Did the gods not tell you about the Trials?" "I didn't think they would talk to us," Chandra said plainly. Hapatra seemed saddened by this. "The gods will always help those who ask for assistance." Nissa's heart fell a little. She never thought she needed gods, but seeing the pity in Hapatra's eyes made her wonder what she was missing out on. "Our five gods are loving and benevolent," Hapatra continued, "I'm certain they would extend their teachings to you." "What did yours teach you?" Chandra asked. "Rhonas taught me I am only as strong as the community I foster. And how to make poison." Hapatra smiled wickedly. Nissa still wasn't sure what to make of Hapatra, but noted that Chandra smiled earnestly at the vizier. Hapatra seemed happy to talk. "There is still time to enter into the Trials while you can. If not, the God-Pharaoh's return is only days away," she said, looking toward the smaller sun kissing the edge of the horns in the horizon, "But if you do not wish to join the rush, then you may wait until the Hours." Nissa suddenly remembered the screaming of the woman in the crowd. Free yourselves! Don't believe the lies of the Hours! "What are the Hours?" Nissa asked. She sensed Chandra move her body back slightly from the conversation. She must have sensed that Nissa would take over questioning. "The Hours after the God-Pharaoh's return. The moment we have waited on for all of history." Alarm bells rang in Nissa's head. "And when do the Hours happen?" Hapatra pointed toward the massive horns in the distance. "The Hours will begin when the sun rests between the horns. I'd estimate any day now." Nissa's sense of calm crashed through the floor. Chandra looked at her with an exaggerated look of false surprise. "Y'hear that, Nissa? The God-Pharaoh returns any day now! How about that." Hapatra nodded. "The quality I love most in our gods is that they keep their promises. You should go speak with one—Kefnet is good with questions." Nissa was having a hard time concealing her fear. Any day now? Only days until they fight a dragon with absolutely no plan? Chandra bowed her head slightly. "Thank you, Hapatra. We should be going now." "No problem at all. Come find me in Rhonas's Monument if you'd like a quick poison-making lesson. I'm always happy to share my craft." "As long as it's not us you're poisoning!" Chandra said with a false grin. Hapatra laughed a little too earnestly. Nissa wanted to leave. "A pleasure meeting you, Chandra! Compete with valor!" Hapatra gave a graceful wave and departed up the stairs to the monument. Chandra went back to reflexively tightening one of her buckles. "Well, she was interesting. What did you make of her?" Nissa didn't, but she wasn't sure how to emote that. Instead she let out a little noncommittal whine and copied a hand-rocking motion she saw Liliana do once. Chandra snorted. "The laryngitis joke was pretty bad." Nissa sat on one of the steps to the monument. Nissa shook her head. "These people trust their gods implicitly," she mused, "and they trust what their gods tell them. Of course, they believe that the God-Pharaoh is trustworthy if their own gods say so." "What she said about the Hours reminded me of that yelling woman from yesterday," Chandra said, taking a seat next to her. "I thought the same thing. We should find her soon." "Can you feel where she is?" Nissa took a breath to prepare herself. She closed her eyes and concentrated. This time it felt like sifting her hand through a basin of sludge. She shivered in discomfort but felt the tug of the woman's energy through what was left of the leylines. Nissa dragged herself back to the surface of perception, panting from the effort. Chandra looked on with concern. Nissa nodded and pointed. "She's near this monument," she said through heavy breath. The two stood up, one on shakier legs than the other, and moved around the building. The walk took several minutes, and as they proceeded around the monument, the character of the architecture around them began to change. These buildings were much older than the ones in the rest of the city, and had more grit to their outer stones than the shining limestone of central Naktamun. Nissa dipped into the sludge again, and felt the tug lead into a narrow alleyway between the monument and a second structure. The ribbon of blue sky narrowed above them as the two women entered the alleyway. Nissa and Chandra walked forward. The walls were quite ancient, with some old writing carved into its sides. At the end of the alley was a sequence of large, strangely-shaped boxes that stood up against the wall. Chandra ran her hands over the carvings and her fingers caught on a pictoglyph of the now-too-familiar Bolas horns. Something to Nissa felt off . . . something that reminded her of the vision she had that morning. She ran her own fingers over the glyphs on the wall. It seemed to tell a story through its pictures; family life, babies with mothers, grandparents sitting around a hearth, an elderly woman leaning on her walking stick. What should be a familiar spread of generations was anachronistic with the city of Naktamun. Above the carvings of people were etchings of the Amonkhet pantheon. Eight animal-headed gods, all gentle and benevolent mammals, birds and reptiles—eight? And etched above it all in fresher carving were the ever-present horns. Nissa's heart was racing. The cut stone of the horns is weathered, but without the ancient grit of every other glyph. If the dragon had created this world, his sigil wouldn't need to have been added on. Nissa's hands shook in fury. Nicol Bolas didn't create this world, she realized, he corrupted it. Memory of the Eldrazi spilled through her mind. Cancerous, alien tendrils poisoning a world that wasn't theirs. Nicol Bolas didn't make this place or its religion, he didn't create a culture on his own, he warped it, perverted it, took what he liked and ruined what wasn't his. She impulsively reached with her senses for something that wasn't there and recoiled with nauseated pain. This world was nearly dead, and it was killed only decades before. "Chandra?" she said in hushed anger. Chandra was further down the alleyway, approaching the strange tall boxes leaning against the wall. They were each slightly taller than she was, rounded in gentle curves and carved with an intricate face. Their color was chipped and old, but she could make out a face painted on each. "What are you two doing down there?" Gideon stood at the opening of the alleyway. A cartouche hung around his neck, and his face was lit with concern. Nissa backed away from the wall, lip trembling. Chandra moved away from where she was and walked toward Gideon. "We found these boxes— "
The fright in Nissa's chest immediately vanished. Her stomach calmed, and she felt as if a cool breath of wind walked in front of her. Oketra rounded the corner of the alleyway. She was taller than the walls on either side, and the lovely silence that followed her quieted Nissa's concerns. The god looked Nissa in the eye. The god stilled. A voice breezed through Nissa's mind, You spoke with this land, Nissa Worldwaker? The voice was soft as wheat and sturdy as a desert blossom. Nissa trembled. She had never spoken with a god before. Yes, she replied, your world is dying and afraid. Oketra said nothing, but Nissa saw the cat's ears twitch back in a moment of fleeting, subconscious fear. The exchange was over in an instant. Nissa let out a breath she didn't realize she was holding. "These sarcophagi are forbidden to approach," Oketra said out loud. "I am sorry, travelers, but I must ask you to let them be." Gideon came forward with an apologetic look and spoke directly to his friends. "It will cause less trouble if we try not to violate their rules. Please." He spoke earnestly. Nissa recognized how much this place and its gods must mean to him. "Thank you for your understanding, travelers," Oketra continued. "I cannot convey my appreciation for your cooperation." Nissa felt incredibly soothed in the god's presence. She noticed the cartouche that hung around Oketra's neck was different than those around the necks of the acolytes. She must have been there when Bolas arrived. What happened to the other three? Nissa projected at the god, her hand touching the pantheon etched on the wall. Oketra turned her head slightly and looked through Nissa. I have no memory of before.
. . . I do not know. Gideon's voice interrupted the silent conversation, "When I get back, I will thank the others for their understanding as well." Oketra straightened out, overcoming some private concern. She looked down at Gideon. "Come, Champion. It is time for your next Trial." Chandra put it together before Nissa did. "You're competing in the Trials?" "Yes," Gideon replied. The god turned to depart, while Gideon stayed behind. "Why?" Chandra asked with concern. Gideon took a deep breath, expecting a verbal challenge. "These gods are good at their core. I want to prove myself to them." Chandra crossed her arms. "That's ridiculous. This whole plane is bad news. 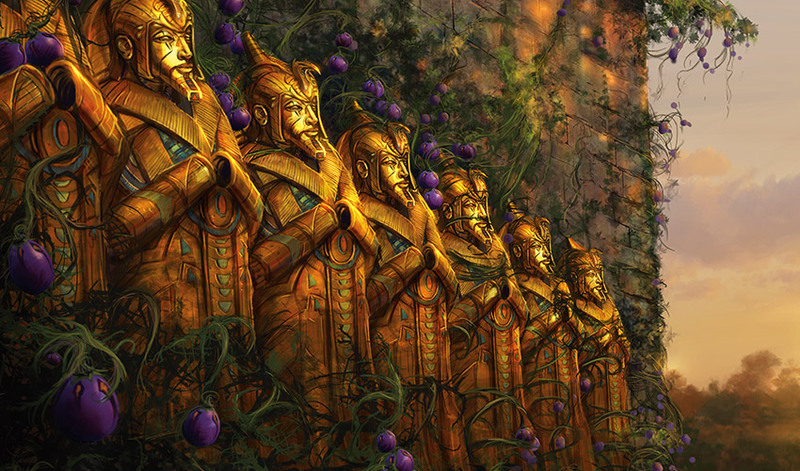 Bolas made these gods, so why would you even think about trusting them?" "I knew you wouldn't understand—"
"This is important to me, Chandra, and I know that these gods are different!" Nissa knew in her bones he was right. Gideon turned. "I'll see you both back at the house." He walked away to join the god. Chandra looked back toward the sarcophagi in disappointment. "I don't get it. Is he trying to get more info by playing their game . . . ?" "He's doing it because he needs to," Nissa said. "He's doing it for personal reasons." We're all doing this for personal reasons. The alley walls felt too close. Nissa walked back into the open for some air, headache throbbing and nausea roiling through her. "Chandra . . . Nicol Bolas did not create this world. He corrupted it." Chandra stopped in her tracks. "How do you know that?" "Look at these buildings. The ones with the horns are all brand new. And in the old parts, anything that has Nicol Bolas's sigil on it was carved on later. If he had built this plane, then his signs would be as old as the rest of the glyphs. Every other building with his mark is new. I spoke with the plane last night, and Chandra, it is old and its pain is new. Nicol Bolas must have come and gone only a few decades ago." The air heated up even further. Nissa backed away from her friend's rising fury. "There aren't any old people here. Did he just arrive and . . ." She trailed off, unable to articulate the fate they both inferred. Nissa didn't want to put her hypothesis into words. "When I spoke with the plane last night, I sensed a terrible scar." "We need to know what he did . . ."
"We need to find out what he changed. If he swooped in here and made himself a god for some reason, then we need to find out what he did when he arrived so we can change it back." Nissa lowered her hands in firm fists. "We can't change anything ourselves. That would make us as bad as he is." "Then what do we do?! He isn't here now, how can we help these people." "They don't seem like they want help." Chandra stilled herself and took a breath. Nissa waited while her friend calmed herself. "We still need to know how he changed this place." Chandra was calm but resolute. "If the gods existed before he arrived, then they're victims too. I need to know more about that woman from yesterday and what made her upset. She knew something about the truth of this place. We can help her." "I want to speak with Kefnet. If anyone can help me understand this place, then it must be the God of Knowledge." Nissa rubbed her temples. "I need to rest. Let us go back to the safe house." They walked, Chandra stewed in anger, and Nissa lost herself in thought. The two women arrived at the safe house. Chandra left without a word to sit on the patio, and Nissa climbed into bed. As she fell asleep, her mind was haunted by the wails of a dying plane and the laughs of a distant dragon.